RUSH: I gotta play this sound bite for you here before we hit the break. This is this morning in Arkhangelsk, Russia, at the International Arctic Forum. (laughing) CNBC Europe has a reporter there — his name is Geoff Cutmore — and he got a sit-down with Putin at the International Arctic Forum. I want you to listen to the laughter here. The question is, “Mr. President, I just want to be very clear. You and the Russian government never tried — never tried — to influence the outcome of the presidential election, and there will never be any evidence found?” Here’s the answer. RUSH: They’re laughing themselves silly over there at the premise. Now, Putin got it wrong. 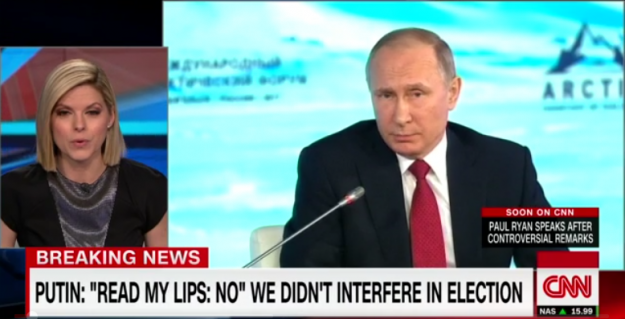 It wasn’t Reagan that said, “Watch my lips: No.” It was Bush 41, said, “Read my lips: no new taxes.” But Putin’s answer if you couldn’t hear it through all the mishmash there, “Ronald Reagan, who once was debating about taxes and addressing the Americans, said, ‘Watch my lips.’ He said, ‘No.’ He said, ‘Watch my lips: No,'” and they’re laughing themselves silly. “No, we didn’t influence the election. No, we didn’t…” They’re laughing themselves crazy over it. RUSH: Let me ask a simple question: We hear the all of this talk about the Russians interfering in the election and tampering with the election, and we know that they didn’t because we know that they couldn’t. How many of you are…? Besides that, how many of you would be bothered by it? Just based on that we know that the Russians tried this, how many of you think it’s this big a deal? Seriously. How many of you think it’s this big a deal, that the Democrats turned everything they believe in over to this one thing?